On Sunday market in Moema, Sao Paulo I found broad beans for the first time since I moved here for two years ago. I got really excited as those green sweet beauties mean a lot to me! My grandmother used to buy them nearly every day during a short summer season in Poland. She used to cook them in salty water for 5-10 minutes, depending on the size of the beans. Once they were cold enough to eat she served them in a big bowl. We used to pop them out of their skins and then eat while watching TV. 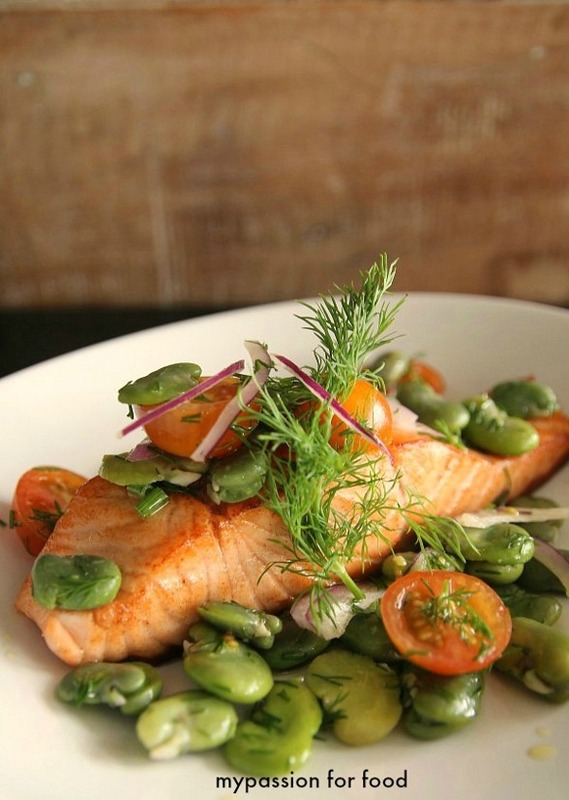 Today I prepared broad bean salad and I served it together with fried salmon. I would like to dedicate this dish to my friend Chef Patrick Bragato who with humor and passion shares his knowledge about French food and his way of cooking. Since September I have been assisting him at the restaurant Au Vin and I really enjoy it a lot. I admire Patrick for his creativity, excellence and leadership. He has a clear vision what he wants, he really communicates emotion through his dishes and he is a great teacher! I have plenty to learn and I am grateful for it! Cook the beans in boiling water for 3-5 minutes. Refresh under cold running water. When the beans are cold, pop them out of their skins. Mix the beans together with cherry tomatoes, onion, chopped fresh dill, juice of lime and olive oil. Season with sea salt and serve on the top of fried salmon. Decorate with some dill.